Lincoln Hills Golf Course Sled Hill in Birmingham, Michigan review, pics, and video. Lincoln Hills Golf Course sledding info and hours for the winter season. I’m usually leery about sled hills on golf courses but Lincoln Hills is an exception. Golf course sledding hills usually mean long walks, no restrooms and little structure. Lincoln Hills is different. The main sled hill is located just outside the golf course clubhouse – just steps away from the parking lot. The clubhouse is USUALLY even open during winter months (weather permitting) and can serve as a warming shelter or a place to use the restroom. When the clubhouse IS open, they even serve hot chocolate and snacks for a nominal fee. Sledding hours are from 10a-5p. The Lincoln Hills Golf Course is open for sledding and cross country skiing, weather permitting, from 10a-5p. Guests are encouraged to call the clubhouse at 248-530-1670 on a daily basis to ensure it’s open. A minimum of 2″ of snow is required for optimal performance. 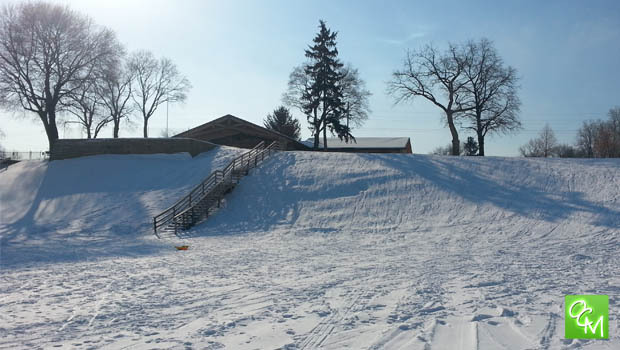 Depending on usage of the sled hill after a snow event, staff will determine if it will remain open for sledding. There are times when the hill has been well used and the dirt begins to show, making it a hazard for usage. Cross country skiing could still be open even if the sled hill is closed. City staff will leave a message on the phone, 248-530-1670, on a daily basis to inform guests about whether or not the sledding hill and clubhouse is open.